It is not uncommon that a great track athlete and a great swimmer would emerge and rise together at the Olympics. But there has never been another swimmer like Michael Phelps. And there has never been another track athlete like Usain Bolt. RIO DE JANEIRO — They became forever connected eight years ago in China, a swimmer from Baltimore and a sprinter from Jamaica; both around six feet, four inches tall, one white and the other black; one made uncomfortable by fame and the other made whole by it. Of one, greatness was demanded back then; for the other, it fell from the heavens and landed at his feet. And they have been intertwined ever since, twin scions of modern Olympic greatness and celebrity, one in an almost constant rise, the other on a roller coaster. And so they play on here in Brazil, one last time (*probably), larger than ever. Sunday afternoon at the Olympic Aquatics Center, Michael Phelps is expected to dive into the water to begin competition in his fifth Olympic Games. He starts with the 4x100-meter freestyle relay, which is the first of his five or six events (three individual and two or three relays) in the Games. (Whether Phelps swims only in the afternoon semifinals or in the nighttime finals will be decided by Team USA coaches; either way, he would be eligible for a medal). He will swim throughout the first week of the Olympics, though not as often as in past Olympics and possibly not quite as fast. But he will almost certainly add to his 22 medals and probably to his 18 golds. Just as Phelps finishes his events in Rio during the first week of the Games, Usain Bolt will walk onto the pebbled surface of the running track at the Olympic Stadium, seven miles away among urban favelas, and begin his quest to become the first person in history to win the 100 and 200 meters in three consecutive Olympics. (He is already the only one to do it twice). Like in Beijing and London, Bolt will accept a torch that only two men can carry and run with it all the way to the closing ceremony. It is a tradition the two began nearly together. Eight years ago, on the morning of Saturday, Aug. 16 in the Beijing Olympic swimming arena, called the Water Cube, Phelps, then 23-years-old, won the 100-meter butterfly over Milorad Cavic of Serbia by .01 seconds. It was Phelps’s seventh gold medal of the Games, equaling the record set by Mark Spitz of the U.S. 36 years earlier. One race remained on his program to break the record, the next morning. He was the king of the Olympics. Ten hours later and just a short walk across a pedestrian mall in the Olympic track stadium called the Birds Nest (Beijing was good at venue nicknames), Bolt, who would turn 22 during the Games, won the 100 meters in a manner that would be seared into the brains of anyone who witnessed it. His long strides and high knees flowed over the carpet in a symphony of speed and power. He dominated the best sprinters with such finality that 10 meters from the finish he turned to the crowd and pounded his chest, yet still broke his own world record with a time of 9.69 seconds. (The underground track community still speculates on how fast he might have run had he not slowed down). He was like nothing anyone had ever seen. And suddenly the Olympics had a second king, sitting on a second throne. The next morning Phelps won his eighth gold medal in the 4x100 medley relay and four days later Bolt won his second and a day after that his third, both in world record times. Discussions and blog posts were struck, arguing which of these two young men was the true star of the Olympics, but that was missing the point because there was no bronze medal in this competition. There was just the two of them, and to choose one over the other was to miss the beauty of their art. Four years after Beijing, Phelps won only four gold medals and two silvers, a performance that was considered disappointing in comparison (and which Phelps would later disparage for his own lack of engagement and preparation). But in a vacuum it stands as one of the best Olympics ever. 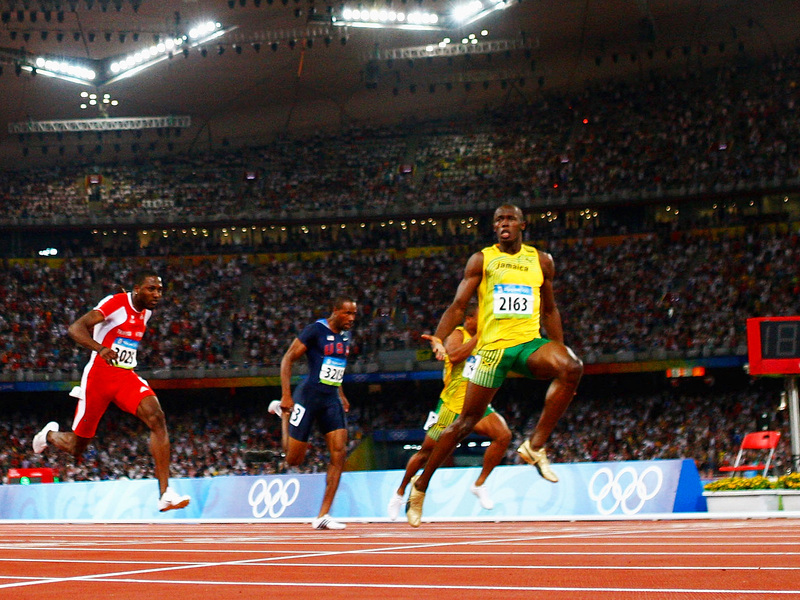 Bolt ran more slowly than in Beijing (or than in Berlin, where he broke both his sprint world records in 2009), but still took home three gold medals. The stories of Phelps and Bolt are the same. And they’re different. For one thing, Phelps was just an average athlete on dry land; big feet and short legs work much better when wet. Bolt was raised on an island in the Caribbean. “Usain can swim,’’ says his longtime agent, Ricky Simms. “But I have never seen him swimming in the 14 years I’ve known him.’’ (So then: Somebody set up a swim-run duathlon for these guys, please). Phelps and Bolt have together benefited from the breakneck commercialization of the Olympics since the 1970s, when the likes of Mark Spitz and Bruce (nee: Caitlyn) Jenner had to leave Olympic sports to make money. There is now an economic space in which a man winning piles of medals and breaking world records could become wealthy, hence extending his career into multiple Games. (This is a good place to note that while Bolt seemed to land full-blown on the Olympic stage in 2008, Phelps won six gold medals and two bronze at the 2004 Olympics. But because there had been much anticipation of Phelps getting eight golds in those Olympics, the six were considered something of a failure. Which is ridiculous. Bolt, meanwhile, participated in the 2004 Games as a 17-year-old, but did not make the final of the 200 meters. So both men have sat upon a rising pile of money, but each could probably have done even better. 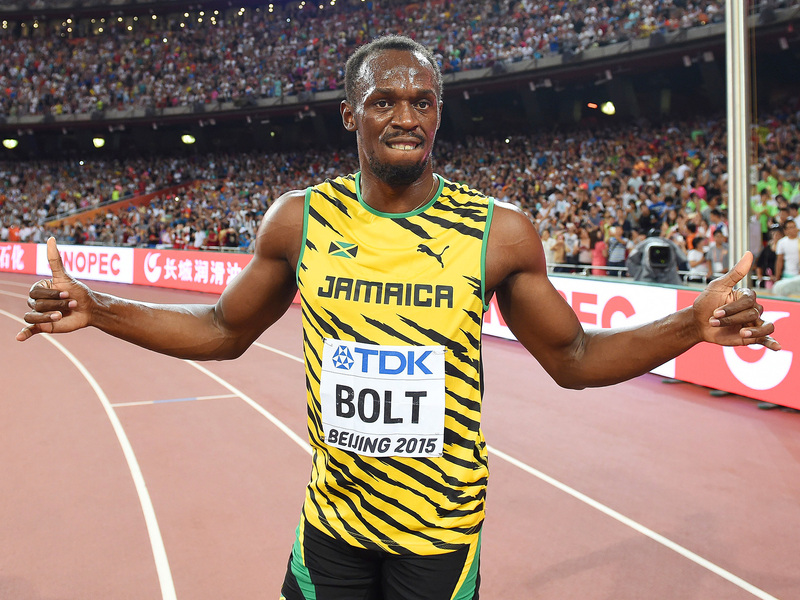 Bolt’s income has been estimated at $34 million per year, a number that his management team doesn’t dispute. He has more than a dozen endorsement deals, the most visible of which are Puma and Gatorade. But he has done little to capitalize on the U.S. market, the wealthiest and most sports-driven on the planet, with a populace that adores Bolt unconditionally. “He really hasn’t done nearly as much as he could have,’’ says Michael Johnson, the 1996 Olympic gold medalist in the 200 and 400 meters, and friend and admirer of Bolt’s. Yet Bolt only tolerates the business side of his job. “You train six days and then do a photo shoot on Sunday,’’ he told me in May. “I’d rather just lie around and rest.’’ He loves Jamaica. And it’s possible that $34 million a year is enough. Phelps’s income has not been estimated as pointedly as Bolt’s, but it is safe to assume they are in similar tax brackets. Yet if not for two drunk driving arrests, the most recent in the fall of 2014, Phelps would surely be worth even more. (Bolt’s rap sheet has been nearly spotless. He wrecked his sportscar in 2012, but the only substance involved was adrenaline; he’s forced to bat aside doping innuendo on a regular basis, because he is a sprinter, but has never tested positive and never been associated with any leaks. Shoddy work by Jamaican anti-doping authorities has thrown some shade on him, but Bolt is largely bulletproof in the doping wars). The two men were once nearly opposites in their embrace of the attention that comes with greatness. I have interviewed Phelps twice at length, the first time in 2004 and the second in the fall of ’15. I have talked to Bolt five times alone, the first in 2008 and the most recent in May of this year. Early Phelps was an awkward, late-stage teenager. Even as he aged into his 20s, he was disinclined to share thoughts or offer insights. He was largely closed off. At the same stage, Bolt was less ebullient than the character he plays on the track, but still open and friendly, game for a round of Q&A. Phelps has nearly caught up. It’s impossible to imagine the 2008 version of Phelps doing a Facebook live chat while walking to the Olympic opening ceremony, as he did Friday night. (And not just because Facebook live chats didn’t exist in 2008.) He is engaged, with an infant son, a grown man engaged with his world, more inclined to explain himself and his work than ever. Bolt remains Bolt, the guy who posted a photo on Instagram of himself and three members of the Swedish handball team a few hours after winning the 100 meters in London. It’s easy to imagine why Phelps might come back yet again. Or even Bolt. But far beyond the emotional reasons for staying or leaving, neither man is going to get faster. They are a subset of two, but, you know, Father Time is undefeated and all that. Phelps could win as few as two gold medals here (poor guy) and Bolt is absolutely vulnerable to Justin Gatlin of the U.S. in the 100 meters (and his Jamaican team, likewise in the 4x100-meter relay). There are no givens, and there would be far fewer in 2020. More athletes stay too long than leave too early. 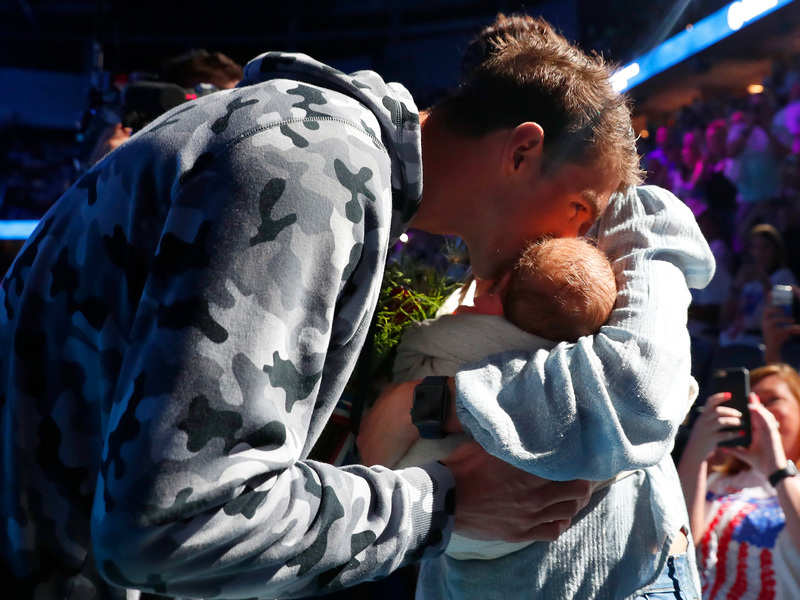 For now, Phelps’s week will unfold in pieces, one race after another, the last individual event race coming on Friday night, one day before Bolt runs for the first time. One last baton pass. One last show.